The focus on CB Richard Sherman’s media boycott obscures the fact that his actions on the field and words at the podium have initiated everything. Good to see you too, Bernie. Apparently, it was something I’d written. The long-ago greeting is one of life’s little blessings when you choose to be a sports columnist majoring in honesty (I don’t use the word truth; I’m not that smart). I don’t recall what I wrote, only the warmth it generated. Back when Seahawks RB Marshawn Lynch was still talking to reporters, he didn’t particularly care for a line of questions from a group standing in front of him. As he rose from his locker, he smiled and started to walk away. That was Lynch lingo for not having wide influence. He didn’t know the guy was from USA Today. Then again, it probably didn’t matter. The reporter wasn’t Kenny Mayne or Conan O’Brien or Jimmy Fallon. Lynch didn’t want to be bothered by questions that didn’t serve his ends. I get that. Among the many variations for the NFL acronym is my favorite, “Not For Long.” The time in the intense national spotlight is minimal for most players. If they have the will and the way, they are entitled work the system as hard as the system works them. The NFL’s collective bargaining agreement with the players union mandates weekly access to players for media covering the team, even though it is largely a suggestion rather than an enforced rule. But Lynch flouted it so steadily that in the run-up to the Phoenix Super Bowl, he was threatened with fines up to $100,000 for non-cooperation. Ever the contrarian, Lynch turned the episode on itself by participating in the mandatory media day by responding to every question with his now-famous line, “I’m just here so I don’t get fined. ” He suddenly became the favored anti-hero of the nation, and the go-to guest for every late-night comedy show. He is among the relative few retired players who will be able to trade on his NFL legacy he hand-crafted. He also had the brains and guts to leave at the top, tweeting out his retirement during the fourth quarter of the Super Bowl with a photo of his cleats hanging from a wire. Brilliant. His last word was wordless. I mention these episodes by way of helping explain why Richard Sherman’s media relations have hit a pothole. First, most relationships between public figures and journalists will become at least uncomfortable and often adversarial because when things go wrong, journalists are obligated to ask why, and to seek an independent accounting. Done professionally and not personally, the inevitable friction is survivable. I recall that Little, after a little more grumbling, kept answering questions when he could have walked away. Or swung his leg. A year ago Sunday, Lynch surprised Carroll and the entire team when he declined to board the bus to the airport for the wild-card playoff game in Minneapolis. Earlier that day, Carroll said on a radio show that Lynch “will play” for the first time since Nov. 15 after rehabbing from abdominal surgery. Lynch was said to have had a strong week of practice. What exactly happened to change things remains conjecture. But Carroll, who had an often tense relationship with Lynch, was embarrassed publicly, which is never a good thing for any boss, even one as tolerant as Carroll. In brutally cold conditions, the Seahawks prevailed over the Vikings, 10-9, thanks to a short field goal that was missed in the final minute. Had the Seahawks lost, the unanticipated absence of Lynch would have lingered far longer. A somewhat similar circumstance now occurs with Sherman. In hindsight, Sherman made three mistakes that challenged the dictum to protect the team. In the Oct. 16 game with Atlanta, Falcons WR Julio Jones caught a touchdown pass over the defense after a communications breakdown between Sherman and SS Kelcie McCray, the replacement for injured Kam Chancellor. Sherman went into a helmet-slamming rant on the sidelines directed at defensive coordinator Kris Richard. Teammates had to help calm down an enraged Sherman. The pass would be the first of three touchdown passes in 11 minutes of the third quarter that flipped 17-3 halftime lead into a 24-17 deficit into the fourth quarter. The secondary seemed temporarily to have lost its balance. Again, the Seahawks won, deflecting the pressure. The second mistake came in the Dec. 24 game with the Rams, when Sherman confronted Carroll and offensive coordinator Darrell Bevell about playcalling from first-and-goal. Again, the Seahawks won, helping defuse things. Crossing the offense/defense separation seemed like insubordination and prompted a one-on-one meeting the following Monday between Carroll and Sherman. Carroll said any punishment that may have arisen was internal. None of these episodes were instigated by media, but by Sherman. But a week ago, he described the weekly access to him “a privilege.” Maybe. Personally, I looked at it like a professional courtesy that has been revoked as of Tuesday, when he said was boycotting some in local media. A lost courtesy is hardly a thing. What is a thing is whether Sherman’s actions didn’t protect the team. “He’s got a mind of his own and he’s got a real thought about it. Whenever you’re trying to protect the integrity of what you say, and as you get represented, and that’s an important thing. I know Richard is tuned into that. He’s very bright and I support Richard always. I have supported him for a long time and will continue to. It’s what Carroll had to say. And given that Sherman has had disputes with Carroll, Bevell, Richard and teammates Doug Baldwin, Michael Bennett, Kam Chancellor and many other people important to him back to his youth — see this story by si.com’s Robert Klemko on Sherman’s history of confrontation — it could be said that we reporters are keeping good company. As to its impacts on the team, there would seem to be only one good answer — keep winning. Maybe he just likes drama in his life. I’ve come across a lot of people like that. Possible. But read the SI story that I linked to in the column, and then see what you think. We don’t know he hasn’t. Just hasn’t been in public. True. Cable seems to be a kinder gentler version since his Raider days, but I imagine he’s still not afraid to stand his ground with players. Cable is a rare man who can recognize his own weaknesses and deal with them as best he is able. I believe that’s called wisdom. It hasn’t gotten to the point where I don’t want him on the Seahawks. Still, I doubt it’s true that his outbursts are calculated for a certain effect, as he claims. That would be worse than his just not being able to control his temper, since the outbursts do not result in any positive effect. Anger can be calculated or spontaneous, and most of us on the outside can’t know. It’s both with Sherm. The problem comes if he begins to wear out his allies. Lou Piniella can testify to that. I think it’s very telling that Carroll refers to Sherm as a “brilliant kid.” I don’t doubt Sherm’s intelligence and talent. But this episode really reveals his immaturity. Being a grown man with a professional attitude doesn’t mean you don’t make mistakes and cross the line. But maturity is what enables you to man-up and make appropriate amends. If nothing else, he owes a public apology to Carroll, the guy who gave him his breaks and who he has now embarrassed. It has nothing to do with the media. But the tantrums and obstinance is truly kids’ stuff. There’s so much to like about Sherm. I hope he grows up soon. I hope we all learn things as we grow. Sooner is better than later, but later is better than not at all. Sherm fears if he backs down, he’ll lose his edge. His teammates probably think so too. 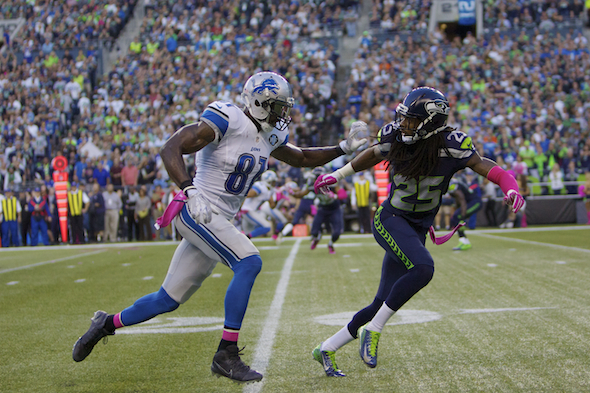 I’m sure being an athlete at that level is an interesting head space, so I’ll give Sherm lots of slack. But not when it comes to publicly criticizing Carroll, repeatedly. I can understand the rants that stem from the brutality of the game. Up to a point. The Sherman episode that still bothers me the most is the Erin Andrews rant after they won the title game against the Niners. That moment belonged to the team and the crowd, their joy at winning. Sherm co-opted it and made it about him. And Lynch’s ‘cleats’ moment was really the same. Stealing a moment that belonged to the Broncos, who were a couple hours away from being world champions. Apparently, it wasn’t enough to have humiliated them two years before. These uber-ego, self branding examples border on narcissism and, of course, are not at all out of line with our society. And that’s what REALLY bothers me. I think Sherman might agree, upon reflection regarding the Andrews rant as stealing thunder. Some of the uber-talented have uber-egos, and it’s part of the price a team/fan base pay to win Super Bowls. Greatness does not always fit in the boxes we set for it. As with any of us who deal with demonstrative anger in the workplace, it can build into widespread discomfort. Sherman is a bright guy with a bright future and high standards. I think he’ll learn from people he respects that throttling back his anger doesn’t necessarily mean compromising his play. First of all, Bernie Little farted thunder and crapped lightning. OK, I think it’s time that Duane Thomas, Chad Johnson/Ochocinco, Terell Owens, Johnny Manziel and Pacman Jones welcomed Richard Sherman to the club. Ryan Leaf sits on the throne and calls their meetings to order. Let’s be honest (not truthful), if Sherman played for the Patriots we’d be assaulting his lack of class. But, he’s a Seahawk so he gets a pass. Hold off, 73. You’re putting Sherman in dubious company unfairly. He’s not a preening diva. He’s way too smart for that. Sherman does put team ahead of self, given everything I’ve heard from current and former Seahawks. Occasionally, he’s wrapped too tight for his own and the team’s good. If he learns to accept the responsibility that comes with that, he’s good to go. As an old fart now, I don’t have a problem with young men, mostly in their 20’s, screwing up from time to time. God only knows that’s the time frame I made my more serious error’s in life’s pathways that affected the remainder of my life. Sherman’s little outbursts due to pride in competition are laughable compared to my blunders. I figured my pal Bernie could help me tell a story. Thanks for sharing a view that some fans can deal with the imperfections of Sherman and the controversies he creates without slaying him, the Seahawks or we scribes. I get the distinct impression that you and Danny O’Neill and several of the other commentators I’ve heard bleat about this have some answer that you think Sherman is not giving you and that you plan to go on asking the same questions until he snaps and gives you what you want. I have a better idea: Tell Sherman what answer you want and let him give you that and you can all go write about it and tsk-tsk and pontificate while he plays football. I heard O’Neill say that he kept pestering Sherman for answers about the sideline incident by saying “Hey, we’re just talking about what YOU did!” The incident happened two weeks before and Sherman had already given his answers several times over. He’s probably under the impression that he answered the questions and is now sick of the topic. Apparently, O’Neill wasn’t satisfied. Then,. this morning, I hear Mike Salk cast Sherman’s reticence as wrong because “we’re just asking what the public NEEDS TO KNOW!” I don’t think Mike Salk, Danny O’Neill, OR YOU speak for all of us. You are not our spokespeople. You are our CONDUITS. I think most of us realize that the TRUE compact between Sherman and us is that he plays football and we watch. We like his performance or we do not. I wrote for newspapers for two decades, back in foolish youth, and I saw the MASSIVE sense of entitlement of journalists, first hand. Journalistic integrity is used to excuse conduct that would get anyone not toting a press badge punched out in the parking lot. Rudeness and intrusive meddling gets glossed over because “The people have a RIGHT to know!” NO, we do NOT. We have the RIGHT to know what people are willing to tell us. This isn’t Watergate, It’s not Snowden and state secrets. It’s the conduct of one very unusual, quirky,sensitive, passionate, eccentric, occasionally irrational ATHLETE and the repercussions of his behavior are his to shoulder and it’s HIS right to determine what he will say and how he says it. And it’s Pete Carroll’s job to discipline Sherman if he gets too over-the-top. NOT yours. YOU asked Carroll about it and quoted what he said. And then, you slanted his statements with this: “It’s what Carroll had to say.” Clear inference? It wasn’t adequate. It wasn’t enough FOR YOU. I know you’re a columnist, so you don’t have the same boundaries that a reporter does. But your lofty view of Sherman and his reactions actually serves, mostly, to extend and exacerbate a situation that most people really see as trivial when compared to the urgency of succeeding in the playoffs. It’s too bad that nobody ever asks the obvious question: When does this sort of pestering and criticism, on a daily basis, become that “distraction” that all of you are SO bloody concerned will be the result of Sherman’s actions? When does daily broadcast picking rise to the level of an Issue for a team that desperately needs its focus? I think you went over that fine line about a week ago. For me, I want Richard Sherman to shut down his half of a football field. Past that, I don’t care of he flips off the Pope and tells all of you to go jump in Puget Sound. Stephen, I can’t speak to your journalism experiences, nor do I care to ruminate on the views of other media members regarding Sherman. I know what I’ve written, and stand behind it. I leave the sweeping condemnations of the people and the profession to you. With one minor asterisk: Sports talk radio is not journalism, it’s entertainment. And ESPN 710 is the house organ for the Seahawks and Mariners. Regarding this column, I pointed out three mistakes Sherman made, two involving public confrontations between him and coaches/teammates, one a regrettable public remark. Neither Carroll nor his teammates would dispute the position. To ignore an issue that Carroll volunteered was worthy of a one-on-one meeting would be neglecting my job. If you don’t want to read about it. that’s your choice. Other readers do. And please do me a favor and don’t try to divine hidden meaning from an attribution like, “Here’s what he had to say.” You’re working way too hard on this. I think the prior comment spoke to the repetitious hounding on a point that had already been addresses several times, not the content. I didn’t make any “sweeping condemnations”. That’s your interpretation and has nothing to do with what I intended OR what I wrote. If radio sports commentators are NOT “journalists”, apparently someone has neglected to tell them that, as I hear them applying that term to themselves all the time. But you left the POINT of what I was saying just lying there: what does Sherman have to do to put ANY issue you guys have with him to bed? How many times are reporters going to repeat what is simply a rephrased version of the same question before they are satisfied? Don’t speak for anybody else, if you don’t feel comfortable generalizing about your profession: what would it take to make YOU feel that Sherman has been properly forthcoming? The fact that so many sports commentators keep hammering away at Sherman about his supposed transgressions, after he’s given the answers he’s willing to give, clearly indicates that you all feel that he’s hiding something or not thinking straight about it or maybe not being sufficiently contrite. He snapped at some of you? Gee. I can’t imagine why. Could it be that he gets tired of people trying to get something out of him that he either A) knows isn’t the truth or B) feels he’s already answered and nothing beyond that is anybody else’s business? I don’t recall that Carroll or his teammates ever DID deny that Sherman made mistakes. Carroll admitted as much and his teammates didn’t deny it. But they were willing to accept that it happened and MOVE ON. It was, for them, a done deal; a minor non-issue that seemed to be crucially important, in the larger scheme of things, mostly to people who need fodder for their broadcasts or columns. I;m not giving Sherman a blanket pass. As far as I’mconcerned, if I had been standing in front of him when he opined about “all that kumbaya stuff”, my immediate reaction would have been, “Gee, is that the same kumbaya business that allowed you to blossom in the NFL and become what you are today?” The difference is, I guess, that I don’t feel it’s my business to dig beyond what Sherman is willing to give…while you guys seem hell-bent to pry…something more out of him. As for “working way too hard on this”, remember that I am not the one that has stoked this “controversy” past the point at which it was even remotely as relevant as an upcoming playoff game. And if I am working too hard, I have a great reason: I don’t see anybody else pointing out the fact that doing the same thing over and over again and expecting a different outcome is inviting comparisons to Homer Simpson. I believe I can say without fear of contradiction that I have as much or more time invested in being a devoted reader of Art Thiel as anybody who reads this website, starting in the early 90s, when I came to Seattle and continuing to this day. You and Paul Gregutt are just about the only two Seattle writers I do read and both for the same reason: because you’re good and interesting. But you do what I do: you write stuff and people read it. And I will put my 46 years of angry letters and emails up against anybody’s because I know that if they’re complaining, they’re reading and thinking about it and it’s written NOWHERE that they should NOT talk back. You won’t find any other complaint like this from me, EVER. This is the first time I have ever thought you crossed a line into Diminishing Returns. I don’t think it’s out of line to complain once in 25 years. You don’t owe me even the bare courtesy of a response but make no mistake about it: I think you’re being mulish about this subject and I won’t be reading anything else about it – from you or anybody else. That’s my $.02. What you do with that is up to you. Stephen, I appreciate that you care, and take the time to write such lengthy responses. And you certainly are entitled to your opinions/complaints. But when you jump on “the media,” you make a generalized condemnation as if we all conspire together to come to one position. We do not, even if we share the same industry. Those of us around Sherman somewhat regularly would, if asked by you, agree on my basic premise: He has had three bouts of public temper that did not serve well him or the team. Plus a fourth one, his threat to Jim Moore, which I didn’t mention in the recent column because it didn’t rise to the level of the others. His behavior is a team issue, because in the ATL game, it hurt the defense, as Carroll admitted after the game. If it’s a team issue, it’s worth reporting on. His teammates and coaches love him, but as with a truculent child/spouse/sibling/boss, he sometimes drives crazy the people who love him. Please read two Sherman stories: SeaTimes Jayson Jenks on Friday and si.com’s MMQB piece by Robert Klemko. You will discover, I think, a complex character who excels in many ways and also pisses people off in ways that can disrupt him/team. Please do me a favor: Try not to let that “fat, greasy, odorous carcass” of your journalism experience tell you that everything that happens in this industry is foul. We need quality journalism now more than ever, and your support would be appreciated. BTW: Nobody asked you to speak to my journalism experience. Nor did I suggest that you ruminate on anything. I drag the fat, greasy, odorous carcass of my journalistic experience around behind me daily, which is why I don’t refer to what I write now as “journalism”. It’s not. I’m fuggen sick of the whole conceit and work diligently to kill off any suggestion of objectivity. It’s OPINION, just as is yours. But occasionally, as has been rarely but forcefully pointed out to me by writers whom I admire greatly, I lose track of where the lines are and go overboard. When that happens, and I vapor-lock into excess, it’s useful to have someone call me on it. Maybe that’s not true for everybody but I decided to err on the side of caution. So does that mean you did vapor-lock in your original comment, and my response was useful, and where/how did you err on the side of caution? I’m confused. How tall are you? Really. Two thoughts: First, Little found a trove of Rolls-Griffins, the most powerful water cooled aircraft engines of WW11. He cornered he market, having a monopoly, ot these engines, killing the sport for lack of competitiveness. Secondly, back to Sherman, he was just named the top corner back in the league. I rest my case. Incidentally, a good friend is organizing a automotive powered thunderbolt race at Lake Pleasant in Arizona. The h1 jet boat organization is pretty much kaput, leaving the much more entertaining roar of automotive power. Anyone wanting more information about this race with possible repercussions locally, should contact the race chairman, Greg Cook at: H2OMG Fest@gmail.com or 888-728-7999 or cell, 623-204-2080. Don’t know what you’re reading Herb, but no post season award I’ve seen rated him so high. He’s still very good, but talent has never been the issue here. And I can’t believe my lede about Little provoked a discussion of hydros. I’m an old fan from the ’50’s. Little was the enemy when I watched the beer boats and Thriftway, Bardahl and the rest of the story. Chock my mention of hydros to withdrawl. One aspect of Sherman has not been addressed. Football players, especially defensive players have aggressive personalities. Without that they would not be playing at this level or anywhere near that. I’m an old guy, 78 years old. I have never been an athlete, though I do through years of acquired knowledge and experience, recognized that football players, especially defensive ones, have to be aggressive personalities or they will not be there. Of course they need to be aggressive. But they can’t be so out of control that it distracts the team. Especially with public sideline confrontations. Your lede recollecting Bernie LIttle’s desire to rearrange your nuts reminds me a comment basketball player (and later coach and NBA suit) Stu Jackson said to me when I was a fledgling reporter: “I wouldn’t give a reporter the sweat off my balls.” So I guess the mention of testicles has different meanings to different people. Every job has its perks.